Single-player. 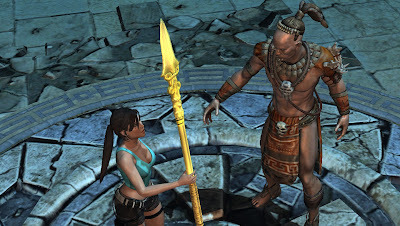 Totec gives Lara the staff. My friend Josh and I played the co-op in this game and it's a lot of fun. We both thought so. In fact, Josh said the game was a lot better than he was expecting. The co-op campaign is magnificent. I can only hope the single-player campaign is at least as good as the co-op. 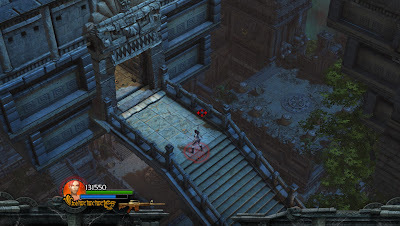 In any case, the game plays from a fixed zoomed out point of view, unlike the more traditional third-person camera associated with the Tomb Raider series. I find the camera option suits the game well. While I was hankering for more of the traditional Tomb Raider elements, this game serves up it's own type of fun. Co-op. Shooting a giant spider. 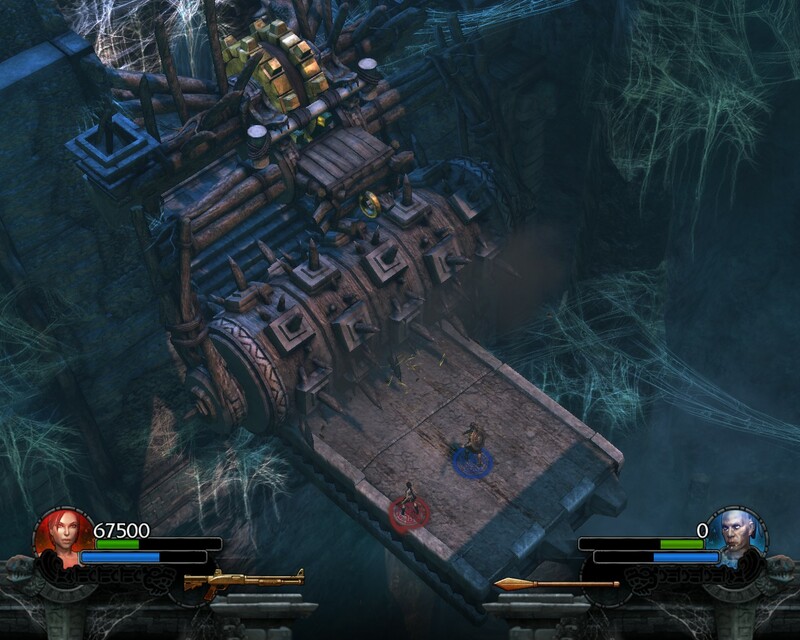 The first level of the game covers how to play and if you haven't played, try not to press confirm too quickly, or else you'll miss the instructions. 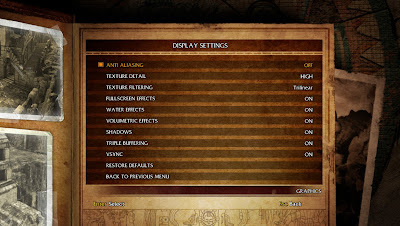 Typically the game will keep a little snippet at the top of the screen, but those instructions might not be as clear. At first I didn't understand how to shoot, but Josh pointed out that I should use the directional right analog stick (we were both playing with gamepads). Tip: You probably won't be able to complete all the secondary goals in a single pass. 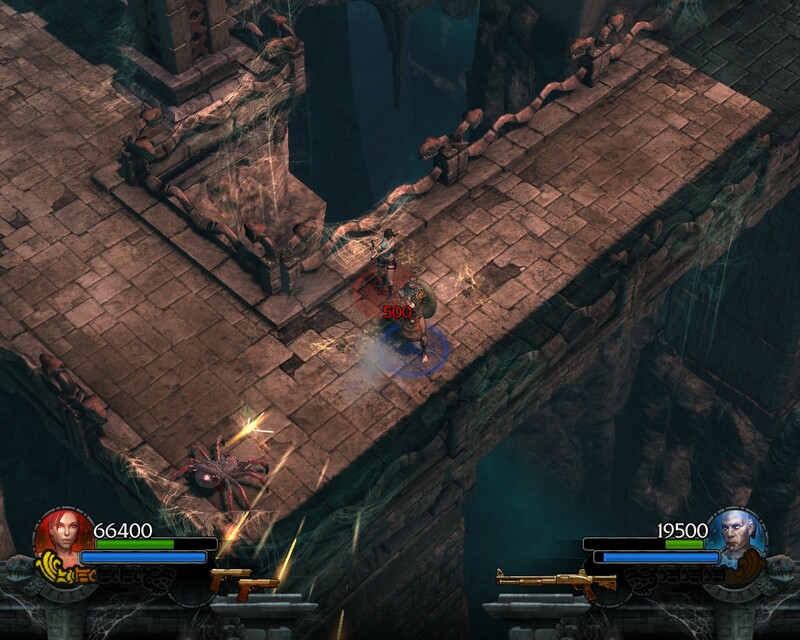 In particular, you'll probably want to attempt speed runs on your second or third replay of a level. I like the graphics and I also like the cut scenes. 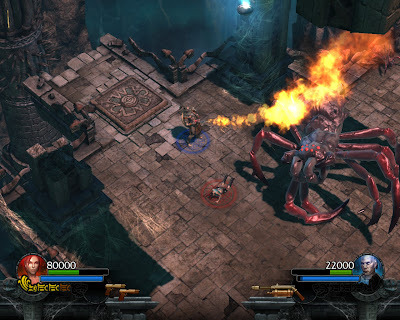 Lara Croft gets knocked down, but Totec fires away. I have yet to try the single player, but if you have a friend to play with, get this game for the co-op. If you're on a budget, wait for the next time the game goes on sale: I snagged the game for $3.74 (75% off $14.99). The DLC was also 75% off. We played the Spider Tomb level and we thought the game was glitchy until we found out that we took an unconventional path through the level. When we took the regular path, the game finally agreed that we completed the challenge (12 leaps over the triple trap). Tip: The game is separated into levels and you can always go back to improve your time on a given level. This one took us a while to figure out. Today I played a bit of the single-player game, just to get a taste for how it's different. 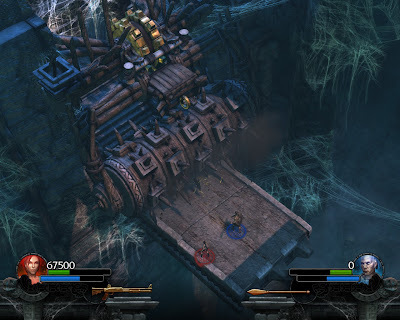 While the layout of the level remains basically unchanged, the single-player game feels slightly less enjoyable due to the lack of fun which comes from the frustration and triumph when working together with someone else. 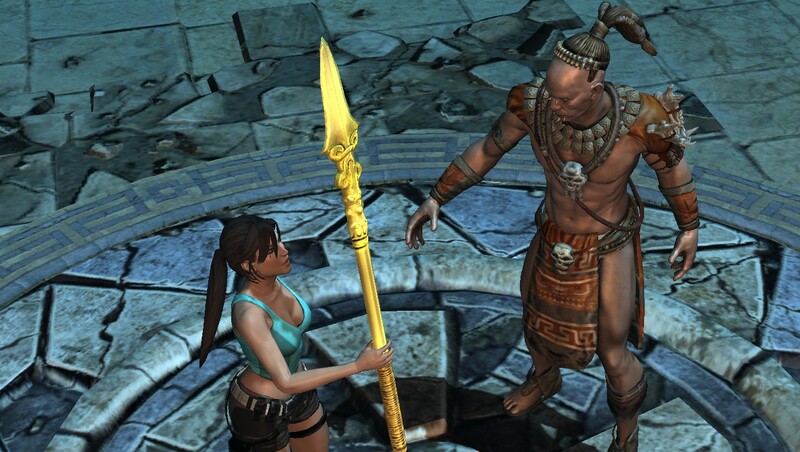 With that being said, the story starts with Totec giving Lara the spear and its up to just Lara to save the day. Puzzles are correspondingly tweaked to challenge a spear-wielding Lara Croft's will to progress. 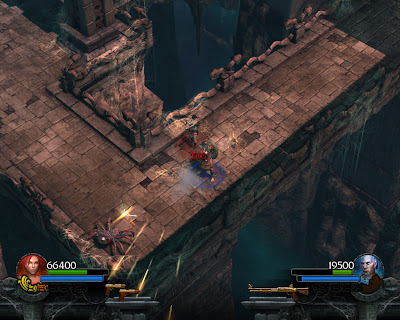 Though as implied, its not as fun or challenging as the co-op mode. On the other hand, it's much easier to explore and look for weapons, relics, artifacts, and power-ups in the single-player mode, because the camera is only following Lara. It's cool to see the environment you had previously traversed in the background. The game gives you one mid-game save which is erased should you decide to start any level fresh. I decided to try and pick up from where I left off during my last single-player game. Apparently there was not much left and so I decided to replay the level trying to get a high score. I was only able to get 148050, quite short of the 160000 mark. In doing so I had to spend a time of 15:30, more than double the 6:00 mark. Tip: I learned that if the dart traps kill the enemy, then you won't get any points. Thus, you have to make sure you get all the kills to have a chance at reaching the high score goal. Squishing enemies with a boulder, however, will give you points. In my second full run I was a little short of 142000. I also noticed the score drops every time you die. Thus, a high scoring run must be without deaths. Tip: In a speed run, just run past enemies. During my third full run, I tried to go through the level quickly but could only get 7:44. I will remember to run past enemies. On my fourth full run, I was able to get the time down to 6:30. Perhaps two places I went wrong is not realizing you *have* to kill the enemies in the room where you get the spear and the fire trap. (In my sixth run I discovered the door opens on its own, but there is a small wait.) The trick to the fire trap is when it's moving clock-wise, you have to let it rotate just far enough for enough time to move the rock from the NW to the NE. I also tried to rush the first grappling hook location, which doesn't seem possible. I did worse on my fifth full run than my fourth. It must count all the time elapsed during failed attempts, because this time I replayed the fire trap to get a better idea. The trick might actually be to go for NE first. In any case, I realized one should jump forward before throwing the grappling hook for jumping and landing to the wall. My sixth and last attempt for the day got me 6:24. The only problem point I can identify is the fire trap. I might have also fell at the grappling hook location which immediately precedes the fire trap. 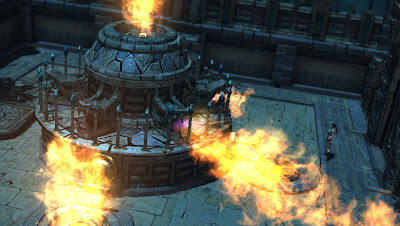 I decided to watch a YouTube guide on the fire trap and it was inspiring. Tip: From watching the YouTube guide, I learned that rolling is faster than running, which ultimately will save a lot more time than solving the fire trap quickly. With the above tip in mind, I played through and got 5:44. That's even with failing the fire trap once and doing it slowly the second time. Note: While attempting the speed runs and/or moving too quickly I'd frequently encounter drops in frame rate and/or skipping. 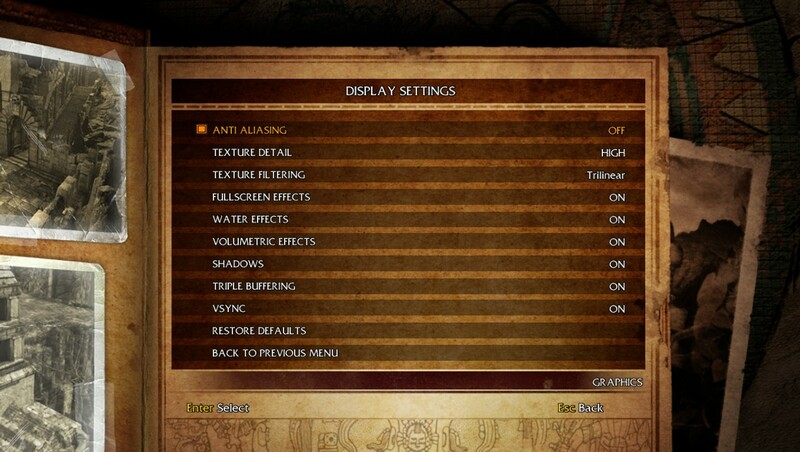 That's with the default graphics settings. Tip: You can skip cut scenes with the ALT button.